Lets say for the sake of our example, that we would like to collect a minimum of 20 male responses and 20 female responses. How can we make sure field surveyor will survey the correct amount of male and female subjects? We can of course instruct the field surveyor to collect 20 male and 20 female respondents, however, this method of quota management is inefficient and can become nearly impossible to implement as quota demands become increasingly complicated and distributed. This is where the built-in quota management of SurveyToGo comes in handy. 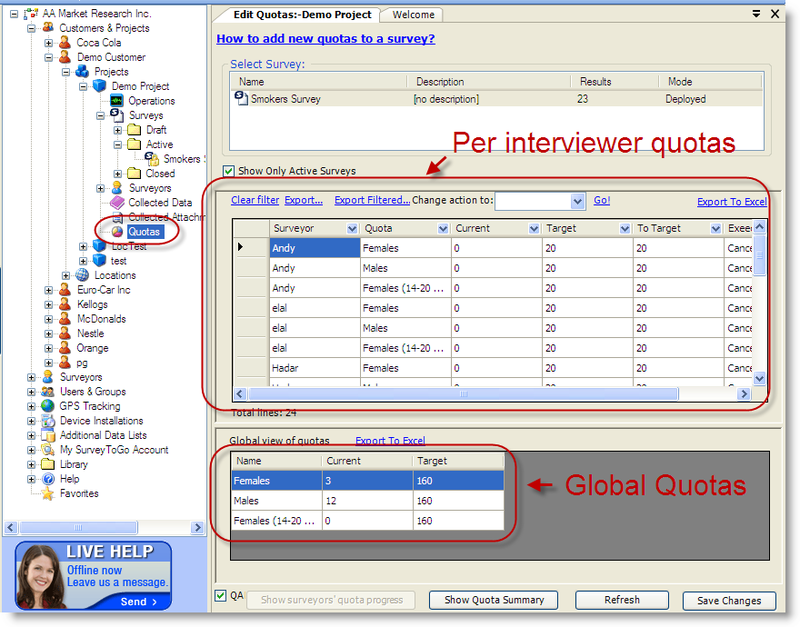 Quota management for the PDA is composed out of a series of quota expressions, and for each field surveyor you define his/her individual limits of the various expressions. Once the quotas of the survey are defined, it is time to assign the specific quotas to the individual surveyors that are assigned to this survey. For more information regarding assigning surveyors to surveys, please refer to Chapter 3. Quota [read only] This is the name of the quota as defined in the Survey Properties Rules tab. Current The current status of this quota for the specific surveyor. The current status is updated as the surveyor synchronizes his device. Target Target quota for this quota. In our example, 20 male and 20 female subjects. Filter – As soon as an exceeding subject is detected, filter-out the subject. The surveyor can view at all times the current status of his quotas. The surveyor can easily figure out how many subjects he needs to conduct from each quota. 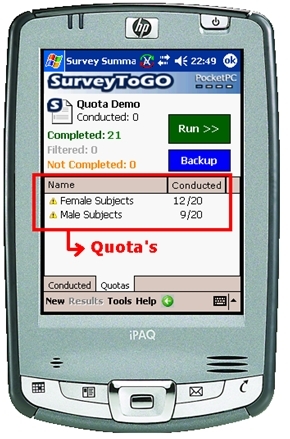 The survey engine in the PDA updates this quota status according to the survey results.